Did Christians kill thirty to fifty times as many people in political violence as Muslims in the 20th century? Well bethought, but I think you should add the Armenian massacres at the hands of the Turks to Muslim side of equation. It doesn’t alter your main point, but adds a percentage point to the Muslim side of the equation. The Iran-Iraq War killed about 250,000, the Afghanistan War 1 million, so there’s room for other things in the original estimate. But if it was 3 million it would not change my point. Is the ratio of people killed by political violence by Christians compared to people killed by political violence by Muslims roughly thirty to fifty to one? Whether or not Nazi Germany counts as political violence by Christians isn't my main point of concern - it's more whether he's sweeping under the carpet lesser known cases of political violence by Muslims, just like he initially didn't mention the Armenian genocide. No, the figures that were used to produce this graph are inaccurate, exaggerating the ratio. millions more in colonial wars. 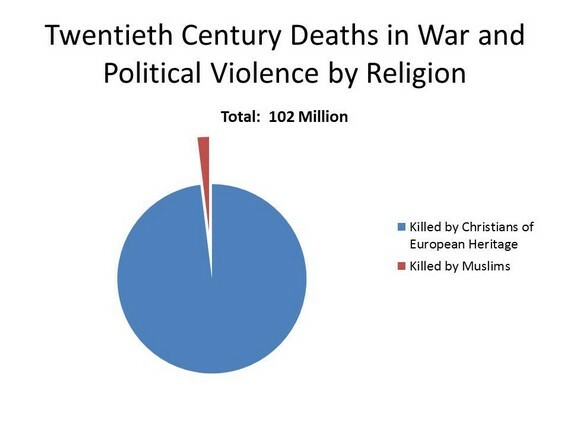 Muslims killed more than a 2 million people or so in political violence in the entire 20th Century. The overall death count estimate of 60 million is reasonable. However, it is incorrect to attribute these deaths to Christian forces. Those countries were responsible for about 20 - 24 million deaths. It is hard to be precise as it's hard to pin how many deaths in the USSR were caused by Germans. These countries were responsible for 20+ million deaths. China was mostly on the receiving end. Japan was responsible for 20+ million deaths, mostly in China. 9 million that died in Russia were in large part due to a civil war that broke out there which was led by socialists/atheists. The Ottoman Empire was a large player in WW1 and suffered between 2.5 and 5 million casualties depending on the source, most of which were self-inflicted. No clear conclusion can be drawn for exact numbers from WW1 but 16 million at the feet of Christian nations is clearly off. Best I can tell about 4-5 million died. It is far short of the 23 million assumed to reach the total in the claim . A cursory glance at Wikipedia's list of modern conflicts in the Middle East and some addition of the numbers from 1900 to 1999 leaves us with a total of 4 million deaths, not counting the Armenian/Turkish genocide mentioned in the Ottoman Empire in WW1. Combine them and you have between 6.5 and 9 million deaths. Some other conflicts of note are, the Partition of India in which an estimated 2 million people went missing (roughly split between Muslims and Hindu). And the Bangladeshi Genocide where a middle of the road estimate brings in other 1.5 million dead. This is by no means an all-inclusive list. My estimate then for Muslim caused deaths is 9.5 - 15 million deaths. In summary, using the upper estimates from each category, the graphic should read total deaths of 116 million (only if it included non-Christians/non-Muslims). So in regards to the claim, Christian nations haven't killed 30-50 times as many people as Muslim nations. The ratio is closer to 3:1. * By definition in claim. Finally: this is by no means an exhaustive list of any of the war categories and grossly oversimplifies something that Rudolph Rummel spends 300 pages writing about in his book, Statistics of Democide from which I pulled lots of this information. According to World War I casualties (Wikipedia), 10-13 million deaths occured in Christian majority countries of which vast majority were inflicted by other Christians (Russian Empire was largely Christian then). Secondary Wars and Atrocities of the Twentieth Century gives us an estimate of around 4 to 5 million. According to Churchill's Secret War, British scorched earth policy resulted in the death of around 3 million people. 250,000 deaths in Philipine American war. Vietnam War caused around 1.5-4 million deaths. 4.5 million deaths in Korean_War. 5 million children dead in Iraq due to political sanctions. List_of_modern_conflicts_in_the_Middle_East gives us an estimate of around 4 million deaths. These wars were largely faught between Muslims. In the 1960s, a military general took over the government of Indonesia. He violently suppressed communist rebellion by killing around 500,000 - 1 million people. The youth wing of Indonesia's largest Islamist group supported him in that. Around 200000 Algerians died in the Algerian_Civil_War which is a predominantly Muslim country. Iran–Iraq War was responsible for the deaths of upto 1 million people.The war was initiated by Iraq's dictator Saddam Hossain who was supported by the United States. US helped Iraq get chemical weapons which increased the death toll. Both parties of the war were Muslim. 139,000–320,000 people died in the Iraqi-Kurdish conflict. One party of the war was supported by the USA and UK. In the Bangladesh_Liberation_War, 3,000,000 people died according to Bangladesh's government. It was faught between nationist Pakis vs Nationalist Bengalis. I have entirely removed the deaths due to partition of India because it wasn't due to political violence. No political entities actually supported the violence. It was the result of extreme conditions people faced while travelling huge distances and other reasons. Not the answer you're looking for? Browse other questions tagged war islam christianity . Did Nobel Peace Prize winner, Martti Ahtisaari, threaten to bomb Belgrade and kill half a million people? Have 50 million Eastern Orthodox Christians been killed in the 20th century? Did war in the 20th century murder more than “all previous deaths”? Are Muslims 25 times more likely to commit terrorist attacks within the United States than non-Muslims? Did Islam dominate slave trade, and did Christians enter the slave market only later? Did more Vietnam vets kill themselves after the war?